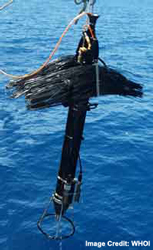 The VMP-500 is a vertical microstructure turbulence profiler for the measurement of dissipation-scale turbulence in the oceans and lakes up to 500 m depth. It is equipped with state-of-the-art microstructure velocity probes (shear probes), high resolution temperature sensors (thermistors), and high accuracy CTD sensors. The VMP-500 is suitable for deployment from small vessels and can be powered by 12V car battery (using an inverter). The MMM group has one VMP-500 named “Mr. Whiskers” for shallow water operations.